What Chrysler is doing wrong - Cars! Cars! Cars! Dodge. Chrysler is doing Dodge wrong. 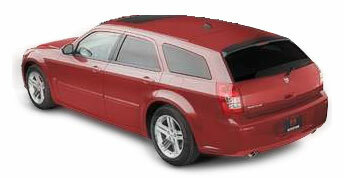 Here's the latest example: Dodge Magnum. Our good friends at The Detroit News already wrote a great review of the 2005 Dodge Magnum RT (I know, a 2005 already?!) and they had mixed feelings about it. In fact, I agree with Anita Lienert: you're better off with a Lexus RX330 for this kind of money. I am not saying the 2005 Dodge Magnum RT isn't a lot of bang for the buck but I am willing to bet the Magnum fades away faster than the Plymouth Prowler. Look, I know Dodge is Chrysler's performance division but making a station wagon with 340 horsepower and then charging $35k for it... well, that's what Chrysler is doing wrong. Man, I'd buy a Magnum if I could...but I can't, so I'll settle for a die-cast from Burago, Solido, or Ertl. Great car, well appointed. Haven't gotten over 13 mpg (500 mi) w/ a pretty light foot and lots of cruise control. Disapointing as I was expecting 15-17 in town and 22-34 on road w/ 4-cyl variable displacement. I am currently driving a M3 cabriolet that I am selling for a new SRT8 Magnum! Go buy your German car and then start paying through the teeth for the maintenance! Not me never again.